My grandfather was never a man given to travel, at least not when I knew him. Then again I never knew him before his hair had turned completely white, and his supposedly legendary volatile and capricious temper had cooled to a point where you would almost deem him incapable of expressing anger save for very infrequent (yet most memorable and ferocious when they did occur) outbursts. When a lion is forced to roar, one better take heed, even if it’s a very old lion. Mom always had to learn this the hard way, because she was often the one to light the match and fan the flames when Grandpa did have an angry tirade. I can’t for the life of me understand why Mom wanted to harass Grandpa over his love of chicken necks or his passion for Nacho Cheese Doritos- but bugging him about what kind and how much food he ate was never a very good idea. Once someone has made it to eighty years old, controlling their diet is pretty much pointless and almost sadistic by then. It’s one thing for a forty-something to count carbs and fat grams and worry about caloric intake, but quite another to impose the High-Fiber, Low-Calorie, Low-Carb, Low Sodium Diet on someone who has already cheated the Reaper for 80 years. I do have to wonder how he managed to eat chicken necks with dentures, but there were very few things that Grandpa wouldn’t eat- save for tapioca and sauerkraut. He lived through both the Depression and WWII and had to deal with more than anyone’s fair share of food shortages, so the way I always saw it is why not let the man eat whatever he likes, even if it means he will snarf a large bag of Doritos and half a pound of Velveeta cheese just for starters. He lived to be 91 so he must have done something right. I think it did him a world of good that he spent the last thirty years or so of his life doing what he wanted- watching the world go around, enjoying TV Westerns probably hundreds of times with the volume cranked way up, cooking and eating, and pretty much sailing along without rocking the boat. I do believe he could have recited all the old Eastwood and John Wayne Westerns by memory but he watched them all over and over just the same. The quiet ones are the ones you have to watch. They tend to have the most colorful stories. I don’t know a whole lot about Grandpa’s tour in WWII other than he spent some time in France and he would gladly volunteer that he “didn’t leave anything in Europe and there is no way in hell I’d go back there.” He had a general disdain both for the French and the British after serving over there but oddly enough not much hostility toward Germans. I don’t know if that is because he didn’t encounter too many of them or if he was just not terribly impressed by our allies. Most of his tour (after he’d had to have all his teeth pulled- sans anesthesia and by a British Dr.-due to pyorrhea) was spent in the States on the troop trains. He belonged to the engineering corps in the Army- the guys who built roads and bridges and such- and as a machinist he could fabricate parts for and repair heavy equipment. Typically the older guys and those with skilled trades did not see combat. Being both older than the typical recruit and a skilled tradesman, he spent most of the war “in the rear with the gear” from what I can tell given the sparse records I could find. He also served as a cook. It was no wonder with the quality and scarcity of rations available in WWII that Grandpa had a talent for making even the most simple and crude food taste good. I have to believe that his love of food came from spending many years of his life not knowing where his next meal would be coming from. A chicken neck would be a feast indeed if that’s the only meat you’ve had in months. Grandpa had an almost vehement dislike of travel in all of its forms, especially air travel. He had been on one airplane when he was in the Army, and as far as he was concerned that was more than enough flying time for him. He didn’t care for travel by sea either. According to him it took two weeks for a ship to cross the Atlantic- two weeks of being crammed into close quarters presumably without access to shower facilities (yikes!) and being surrounded by people puking their guts out from sea sickness. I’d never heard him say much against train travel except that he had been in all of the lower 48 states and had no desire to travel them again. I would have to think the most disturbing aspect of riding the troop trains would be observing the constant influx of young men being sent to divers places, many of whom you know will not return alive. Even worse, the coffins containing the dead were shipped back their hometowns on the same trains that had whisked them away. While Grandpa never mentioned this, he had not only had to have known it but would likely have observed or even assisted in the loading and unloading of the dead. He quite possibly could have observed or even actively loaded and unloaded the corpses of those he had seen in passing, alive, only days or weeks before. I wonder what had to be going through his mind- keeping the behemoth machines rolling- being a part of the higher machinations of war- feeding the machine that feeds the machine so to say. I understand that WWII is probably the last instance that the US has seen of what could truly be called just war. Nobody, at least publicly and out loud, challenged the necessity of bloodshed and martyrdom to defend our freedom and that of our allies. Unlike subsequent hot and cold wars in the 20th and now 21st centuries, in WWII the enemy was clearly defined as were the goals to be accomplished. Even though I am sure that Grandpa as well as those who he served with understood the necessity of what they were doing, I have to believe that there was an underlying grief at the carnage, the senselessness and the sheer monstrosity of war. I have to believe that there was despair in the constant rhythm of the trains, a swan song in the mournful sound of the steam whistle. I also find it intriguing that even so close to the “Day That Will Live in Infamy” (Dec. 7, 1941) the utopian dream of better life through technology was alive and well. 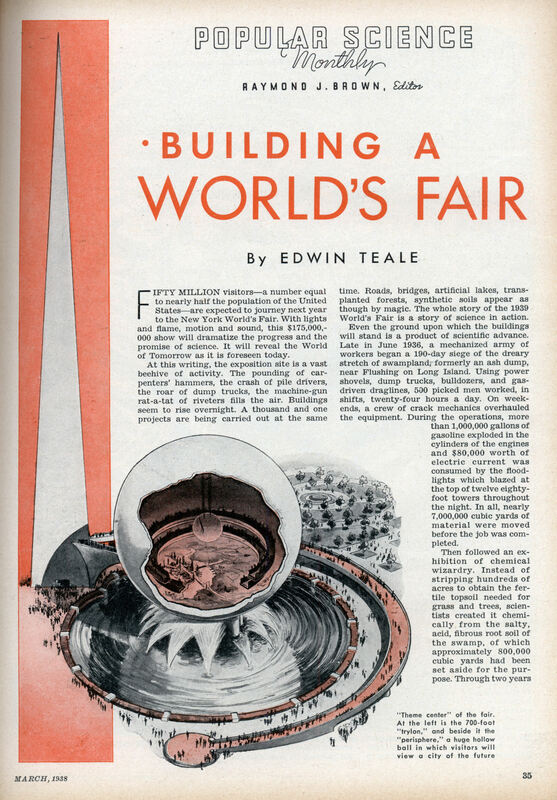 To look at the exhibits featured in the 1938 World’s Fair there is little to suggest that in the coming decade the world will undergo such horrors and fundamental changes as have never been seen before or since. It’s curious to imagine the little art-deco microcosms depicted in the exhibits as they would have evolved apart from the influence of war- if they would have evolved into anything at all. To say the picture drawn by the World’s Fair was optimistic is an understatement. There is supposed to be a time capsule buried in NYC from the 1938 World’s Fair- here is the book listing what the capsule contains– and some of it makes me wonder what in the flip they were thinking. I could really care less about such trite statistics as the school enrollment of the NYC public schools in 1938, but it must have seemed important to include that at the time. Then again it would be interesting to experience a world untainted by the specter of Global Thermonuclear War, a world free of Islamic extremism terrorism, a world that in comparison seems innocent and naive when compared to today. One could speculate ad infinitum how the world would have been dramatically different if somehow WWII would have been avoided- if Hitler had been assassinated early on, (plenty of folks tried!) or if the attack on Pearl Harbor had been thwarted or re-thought. Would the technological advances brought on by wartime necessity have ever materialized- especially the advances in medicine and in the manufacturing sciences? Would there still be life-saving antibiotics and surgical techniques that were developed and perfected during that war? Who would be alive (or who would have lived longer) and who would never have came to be if not for the circumstances of that war? I don’t have the answers for those questions, except that maybe somewhere there is a parallel universe in which a decision or two was made differently, and as a consequence it is a different world where the long-dead walk alive and the never-born are as flesh and blood as I am today. Freaky things to be contemplating on a Friday afternoon for sure.